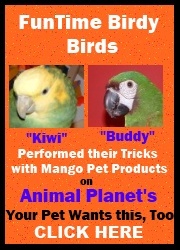 Let your bird take command of his own starship. The adventures are limitless as is the Galaxy he will travel to. Bird toy includes 4 large Spinning Molecules, 5 large wood blocks 6" x 2.5"
Bird toy measures 16" long and 6" wide. Starship Trooper Macaw/Cockatoo Bird Toy4Rishad MohammedFebruary 2, 2017My greenwing macaw Riko loves playing with this.It's the first toy that he hasn't completely destroy in a couple days. Starship Trooper Macaw/Cockatoo Bird Toy5VickiDecember 21, 2014Sophie loved her new toy. Its colorful and she loves to choose which item to chew first. Large and plentiful items. Package was addressed to both birds and shipping was prompt and efficient. Will definitely shop this site again. Very pleased. Starship Trooper Macaw/Cockatoo Bird Toy5Stephanie K.April 5, 2011The construction is slowing Scooter down as far as his ability to tear this toy apart. The wooden blocks are sturdier. It is lasting a little longer than some other toys.